Today having a personal email address is essential. Buying something online, booking a flight, even paying car tax all require an email address. But where do you get an email address ? and how do you make one? 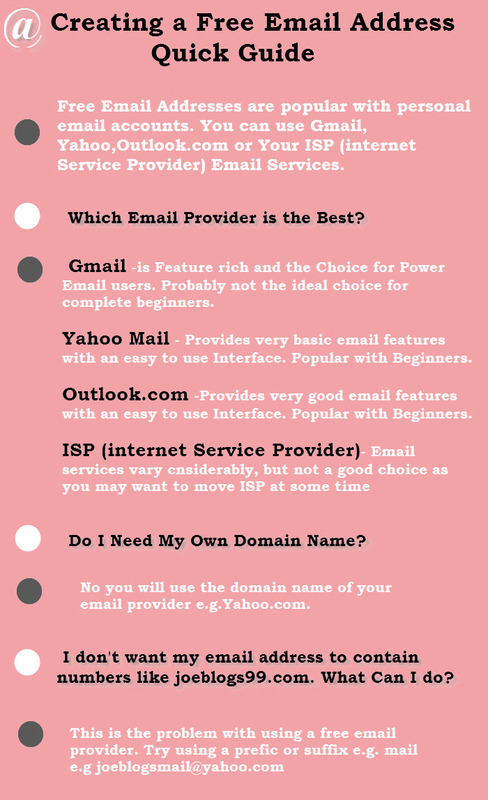 For personal email most people will choose to create a free account and email address using the free email services of Yahoo Mail, Hotmail (outlook.com), Google or an ISP. These email providers provide excellent email services that can be accessed using a web browser,mobile App and desktop email client e.g. outlook. However, If you need to create a new email address for a business then the free email providers aren’t the best choice and you need to look at getting your own domain name. Many people that are new to email seem to have difficulty understanding the difference between email accounts, mailboxes, and email addresses. Here is a quick Diagram that shows how they are related. 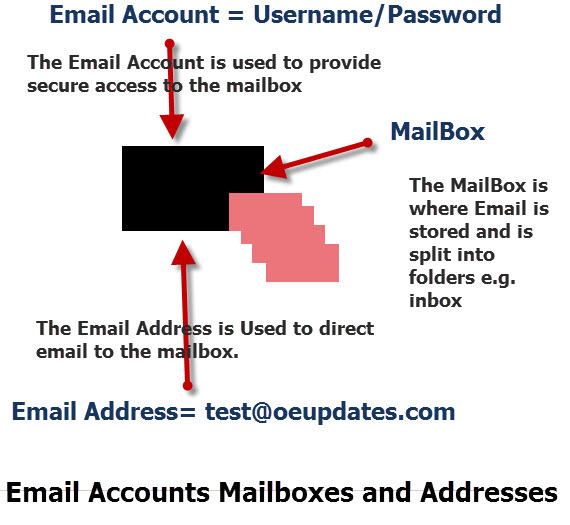 An email account is a username/password combination that gives you access to a mailbox where your email is stored. Although they all offer good reliable free email services they do differ in features and ease of use. It is important to appreciate that the perfect choice for a frequent email user is not necessary the best choice for a casual email user. Access via POP3 and IMAP4. If you will be accessing the email using web mail (web browser) then for infrequent email users a simple web interface is preferred. Both Yahoo mail and outlook.com offer very clear and simple web interfaces and make a good choice for beginners. Google Gmail provides a much more feature rich interface, and makes a good choice for power users. 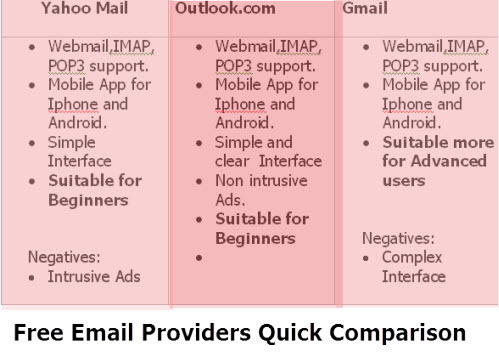 Wiki comparison and Webmail war: Gmail vs. Outlook.com vs. Yahoo Mail. Almost all ISPs (Internet Services providers) provide email services as part of the Internet connection package. In the early days of the Internet most people used the email facilities provided by the ISP (e.g. AOL-America online). The main problem with ISP email is what happens if you decide to change ISPs? In this case you will be forced to change your email address. It is for this reason that I don’t recommend using ISP email addresses. The main disadvantage of free email accounts is that they contain ads. If you don’t like the adverts in your email then Yahoo! Mail Plus and ad free Outlook.com offer low cost and ad free email. Also the email accounts don’t expire (provided you continue to pay for them). Google’s paid option is focused more on small business, as it only works if you have your own domain name. If you are outside the USA you will automatically be redirected to a local Yahoo site. 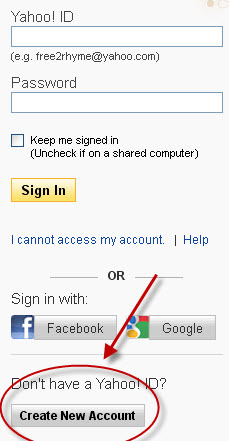 You should find a link to create a new account next to the sign in button. It asks for your date of birth – I don’t give my exact DOB because of security concerns. If you don’t want to give yours then use a memorable date, and stay in the approximate year/month to your real one. Try to use a second email address if you have one, or use a spouses email as the alternative email. This is important for recovering from a lost password or hacked account. You can have the standard Yahoo.com or use country specific yahoo domains like yahoo.co.uk and yahoo.de (Germany). This video illustrates the problem faced by many. You can also separate names with a full stop so try joe.cope@yahoo .com and if you have a middle initial then you could try. If you don’t like the idea of using a domain name from an email provider like Yahoo you can create your own personalized email address. To do that you will need to register your own domain name and get email hosting. 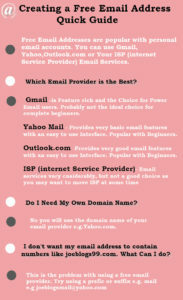 -See setting up email on your own domain name. You can expect to pay around $10 per year for a domain name and around $2 per month for the hosting. The advantage of having your own domain name is that you can keep it for life, and don’t ever need to worry about changing email addresses. Depending of your choice of domain name it can also be shared. The setup process is basically the same as for business email See Setting up email on your own domain name. The email address doesn’t belong to you. The email account/address will expire if you don’t use it! You will normally have to tolerate ads in the email, which can be annoying. The provider can change terms and conditions at any time. You usually have a very long and hard to remember name i.e. They all support web based access which makes it possible to easily access your email from anywhere. You can discard them when you don’t want them. For business email users then having a professional business email address means having your own email domain name. Getting your own domain name is easy, and low cost and is not restricted to businesses as domain names can be purchased by individuals as well as businesses. See Small Business Email. Here is a video I created that covers the main points above. Q- Can I move to another provider it I am not happy, and what happens to my old email address. Q– Can I create/make more than one email address? A- Yes Yahoo Mail allows you to create an extra email address ona single account. Q- Can I get my own domain name if I don’t have a business? Q- I created my own email address but I don’t think it is suitable can I change it? A- Yes there are several ways of moving to a new email address.As an example take a look at How to Change Your Yahoo Email Address.